The photo, from Walter Magazine out of Raleigh, North Carolina, shows a poetry box installed by poets Dorianne Laux and Joseph Millar in front of their Raleigh home. 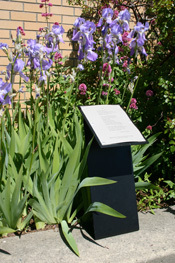 If you’re curious about poetry boxes/posts/poles, here are a few places to find inspiration: watch the videos, Jim Bodeen’s Poetry Pole (and the related post from Blue Begonia Press) and Portland’s Poetry Posts; look at the Poetry Box page on Facebook (click on Photos and browse the albums); and see the map of Portland (OR) poetry posts. Here’s an L.A. Times profile on a local poetry box-er and an article about a poetry box installed in a Lancaster, Pennsylvania, park. If you have other favorite poetry box links or stories, please leave a Comment! This is such a nifty idea…. will consider creating one of my own.